Gameaholic.se is a non profit association founded in 2002. Today we are global with members of mixed ages and nationalities. The website and its web, gaming and communication servers, is leased or operated by individual members. 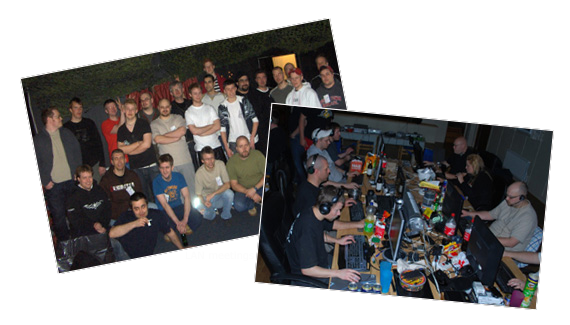 We have our own Discord, Teamspeak 3 with 400 slots and arrange a 4-day long LAN meetings in Sweden every year and more. Here are the rules to folow.. .
1:2 - English/Swedish is the main languages in our gaming community. 1:3 - Gameaholic.se is a non profit association with a free membership. 1:4 - As a member you are approved to use the [GHSE] tag in-game and on accounts. 1:5 - NEVER advertise, recruit or head hunt in here for other organisations or activitys besides our own! 2:1 - Do not post "offensive" posts, links, images or copyright-infringing material. 2:2 - Remain respectful of other users, moderators and administrators at all times. 2:5 - Your registration must be approved by an admin before you can start use the forum. 5:1 - Each channel has its aim and purpose, please follow and respect it! 5:2 - To get full access to our Discord, you need to be a registerd member. 5:3 - If you invite new people to Discord, ensure that they register on the forum. 5:4 - To get the Streamer rights, a member need to have over 50 followers on Twitch. 5:5 - Always inform others before start broadcasting or any kind of recording. 5:6 - Any type of advertising and recruitment (besides our own) is totally prohibited. 5:7 - An administrator has the full power to kick or ban players who do not follow the rules. 6:1 - Only the management has the rights to start a server named "Gameaholic.se" etc. 6:2 - A Gameaholic.se server must follow a certain code which the management determines. 6:3 - Read and follow the server rules at our forum, based on that particular server being played. 6:4 - We do not accept any kind of cheats, hacks, exploiting bugs, glitches or bad behavior. 6:5 - Inform present members before starting Stream, broadcasts or other type of recording. 6:6 - An administrator has the full power to kick or ban players who's not following the rules. 7:1 - Only the management has the rights to start a clan, guild or society etc. in Gameaholic.se name. 7:2 - A clan, guild or squad etc. must follow a certain code which the management determines, no one ealse. 7:4 - A recuiter to a Gameaholic related clan, guild or society must clearly inform those who it concern, about their own internal rules. 7:5 - Creation of a Clan, Guild or Society etc. shall only be made in games where we cant host our own server, like in MMO-games etc.